Viral Traffic Dominator 2.0 is launching! We’re excited to announce that Viral Traffic Dominator 2.0 is launching! 1. More possibilities to create traffic and advertise your business. 2. More possibilities to make money for you as an affiliate. We want to provide the best service for our members! we teach you how to drive more TRAFFIC to your offers. Everything will be ready very soon! VIRAL TRAFFIC DOMINATOR AFFILIATE PROGRAM! Viral Traffic Dominator is a traffic generator and advertising tool that provides high converting traffic using anunobtrusive format ad with urgency-generating countdown timer and specific niche targeting. It’s pleasant to look at, and it disappears on its own. It features a ticking countdown timer that counts down and it disappears when the timer reaches 0, which creates ultra urgency and explodes click rates; Go here and wait some seconds so you can see the banner at the bottom. Practically the user earn ad credits by using special links that will shows the ad on his pages.Viral Traffic Dominator includes a great variety of products, there are over 30 products to promote (monthly recurring and one time payments) with various prices from 9$ to 137$ ; by promoting this program you will be remunerated if the visitors you send purchases any of this products, all you must do is promote your Click2Sell affiliate link. Earn 50% of every purchase for life: When you make a referral it’s yours forever! You take 50% of all purchases ,both one time and recurring, so if a user buy a 33$ / month membership you will get 16.50 $ every month as long as he don’t cancel his subscription. Earn free advertising when you promote your own affiliate link: You can use our link generator to obtain the special url that allows you to earn ad credits while you promote your affiliate links. Cloak your affiliate links and protect your affiliate commissions: using Viral Traffic Dominator special links you can hide your affiliate code and protect your affiliate commissions from being stolen. Shorten your affiliate links: use our url shortening service vtd.cc to prettify your affiliate links and at the same time earn free advertising when your links are clicked. 1,000 Bonus Ad Credits just for joining: This is the bonus for joining our program for free! with 1,000 Ad credits you can show your ads 100 times. Send solo email to your referrals every week: create your own downline and send promotional email every week using our mail utilities. It’s very easy to make referrals, the homepage consists in a high converting sales letter where the user gets detailed information about the product and he can sign up for free within 1 minute. Often just after joining he buy a one time offer or some ad credits package. 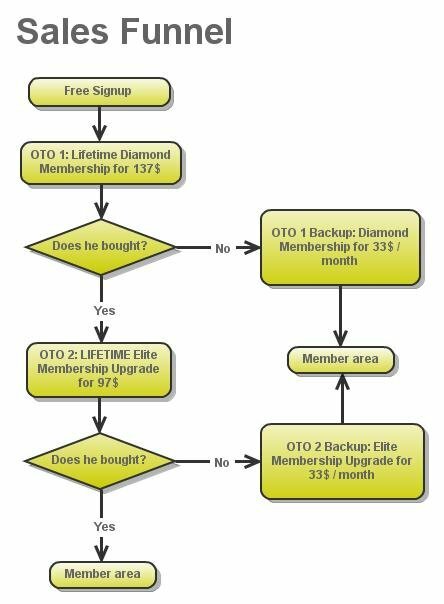 The paid memberships adopt different prices depending upon the one time offers or lifetime offers. This is the Viral Traffic Dominator sales funnel: after user join for free he will go trough this. You are currently browsing the Viral Traffic Dominator Blog blog archives for March, 2014.